Do you like to ‘make and do’ stuff? We have a different kind of MAKE & Do for you this time. 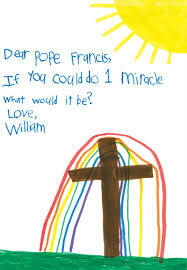 This is your chance to write a letter to Pope Francis! 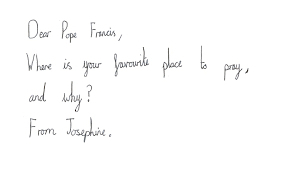 Here are some examples of letters children have written to the Pope. 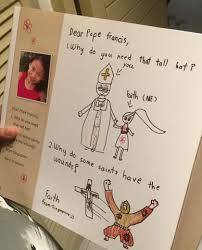 Do you think that you could write a letter to Pope Francis? Here is what you need to do……and don’t forget to ask an adult if you need some help or have a question! Write your name and your address at the top of the page. Put your age as well. Next write your letter and then put it into an envelope. Then put this address on the front of the envelope. You will need to get a stamp to post the letter. Ask an adult to help you. And let us know if you get an answer! Have fun!